Document scanning is an interesting old business. No, we know, it doesn’t look like it from the outside. And we’re happy to admit that the majority of what we do isn’t exactly the stuff movies are made of. But there are moments when we get to be involved in a little slice of something a bit special. We recently got our hands on a particularly interesting folder of documents – letters written in the late 1930s by an Austrian Jew called Karl. With war looming, Karl had sent his only daughter Eva to England on the Kindertransport. She was just 13 years old. He didn’t know, as he wrote faithfully to her of life in Vienna, that they would never see each other again. One day Karl’s letters simply stopped, and Eva would later confirm that he had died in a concentration camp. The letters were in pretty good condition when they were brought to us by Karl’s great-granddaughter. But the sad truth is that paper doesn’t last forever, and she wanted to be sure that neither time nor something more dramatic like fire, flood or rampaging toddlers would destroy these precious family documents. Scanning them was a slightly more complex procedure than you might imagine. First they had to be taken out of the folder they’d been bound in, then we had to straighten out any bent pages. We used our swanky Book Eye Pro 4 because of the delicate nature of the documents, and had to play around with the contrast and brightness to optimise the images and get the best results. Oh, and indexing them wasn’t helped by the language barrier and the use of Roman numerals in the dates! But we do love a challenge, and we were as pleased with the results as the client was. 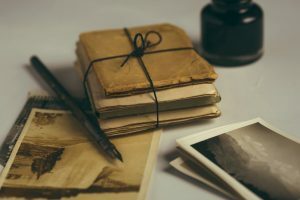 “My grandmother would be so thrilled if she knew that we’d managed to preserve her father’s letters so that they will never be forgotten,” she said. It turned out to be home videos of her from newborn to 18 months – the same age as her own twin daughters are now. Watching the digital version that we created for her was, she said, an emotional journey down memory lane. These days we have hundreds if not thousands of emails stored on our computers and filming our kids is as easy as whipping out our mobile phones. So perhaps the adults of the future won’t appreciate the nostalgic joy of rediscovering the past in the same way as we do now. But for a lot of our clients, history could well be lost without people like us to restore and preserve it for them and for their children and grandchildren to come. Which is really pretty amazing, when you think about it. Do you have old slides, photographs or documents you’d like to preserve, or analogue media you want to transfer to more accessible digital formats? Get in touch today and find out how we can help.